What can an IPTV network achieve in a higher education setting? New technology is supporting the next generation of educators and learners. Now IPTV is part of the higher ed video equation. Perhaps no other technology trend has had a bigger impact on education than the digital revolution. Today’s typical classroom is a multimedia world vastly different from the school experience many of us remember; the expansion of digital technologies has profoundly influenced how, what, when, and where students learn. In particular, video technology has enabled a new generation of innovative teaching methods that enhance written course material, engage students in exciting and attention-holding ways, and support each pupil’s individual learning style. Many of today’s school systems are committed to providing the richest-possible multimedia and experience for their students, but they’re struggling to deploy the right technical infrastructure. Students of any age, from preschool to graduate students and adult learners, can benefit from well-designed video content — but the most effective applications require a technology platform that is flexible, scalable, and affordable. IPTV networks, particularly those based on the latest technologies, offer significant video quality improvements and provide a unified user interface for live, pre-recorded, on-demand, and Internet-sourced video. And recent cost reductions, particularly in key software and server components, have now made IPTV technology affordable for virtually any school system. Traditionally, schools have been wired to support three separate networks — phone system, data (computer) network, and analog video distribution over coax cable (usually via television). This was a costly solution requiring multiple pieces of equipment to deliver isolated video content and applications, and it’s been made obsolete by today’s IPTV solutions. 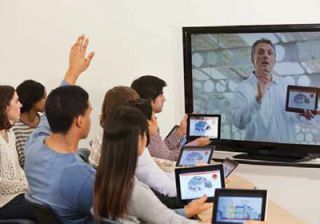 In these environments, video delivered to the classroom piggybacks on the same network that connects the school’s computers and connects people to the Internet. Several recent developments in IPTV technology have made it a viable solution for educational video delivery, such as the increased bandwidth now available on school data networks and the emergence of the H.264 video codec. Another key driver is the development of multicasting switches that enable the delivery of a single real-time video stream to thousands of viewers, without overwhelming the network (in contrast, consider the devastating impact that 1,000 unicast streams might have on the network). Such an IPTV network offers a relatively simple solution to the three biggest video challenges for today’s educators: quality, management, and cost. Pristine video quality is a must for any system that will engage today’s students, discriminating consumers who are accustomed to accessing high-quality HD video even on their mobile devices. With a well-conceived IPTV delivery system, schools can provide even SD video that is orders-of-magnitude better than the snowy images of the old coax networks. Also, legacy analog systems were very inflexible, requiring a significant upfront investment and no ability to adapt to changes in technology. Because IPTV networks have built-in scalability, they offer an easy migration path for schools that opt to start out with SD, and then upgrade to HD as the budget permits. The lack of integration in the old analog systems presented real management challenges for teachers, who had organize materials scattered in many locations and existing in many forms to build their curricula. With a centralized management system, an IPTV-based video delivery platform places all available resources within easy reach of educators and makes them easy to access, whether the video pre-recorded, streamed over the Internet, or viewed live on television. In order to deliver on their true educational potential, IPTV networks must include a few key technology elements. First and foremost are IP switches that can handle multicasting. High-quality encoders are also critical for raw video material that is to be ingested into the system, because they convert the content into formats that are compatible with the protocols used on the IPTV network. On the other end, high-quality decoders take the stream and convert it back into the SD or HD signal for viewing on the display device. Other important elements are servers and middleware that offer key features for video management and access. Such features might include a channel guide for viewers to see and select programs that are currently playing or are available in the video-on-demand content library, or access control mechanisms that use device IDs, passwords, or other security protocols. In the most sophisticated IPTV video settings, the school district office leverages the middleware to control and publish video to each individual school, tailored to the age of the students and the appropriateness of the content. IPTV video networks are transforming how students consume and use video, leveraging a medium they’re well familiar with to make learning fun, engaging, and effective. The possibilities are endless, ranging from live and pre-recorded educational television to video-enhanced morning announcements, digital signage, a channel for student-produced content, and outreach to home-bound or off-campus students. Educators who choose to deploy high-quality, all-digital IPTV networks throughout their facilities will be well-positioned for future growth as new content sources appear and as educational technologies continue to evolve in the 21st century. Jordan Christoff is president of Visionary Solutions Inc. (vsicam.com).